When I first heard about Alabama Contemporary Art Center’s (ACAC) plans for its latest exhibit, “Raise 251,” it was infused with director Amanda Solley’s enthusiasm. A recent encounter with it “raised” thoughts but they exceeded her relayed plans. By Solley’s account, the exhibit seeks to highlight our area’s variable levels of health, with an emphasis on nutrition. She mentioned community gardens, agriculture, farmers markets and low-income communities’ access to healthy food. When I walked into the facility at 301 Conti St. just hours ahead of the Artwalk crowds, the first thing I faced was about growth but not foodstuff. It was flowers. Wanda Sullivan’s series “Synthetic Naturals” came about in recent years when she discovered a way to reshape images of flowers. The series of oil on sizable canvas is entrancing. Hydrangeas, orchids, azaleas — all ghostly and inviting but reshaped. There’s even a nod to a previous fixation when butterfly wings appear with a magnolia. Pinky M.M. Bass has two installations. One is “Homage to Henrietta Lacks,” a nod to the now-famous African-American woman whose cancer cells became one of the most important cell lines in medical research. Taken without permission in a 1951 biopsy, they’ve been reproduced countless times and are still in use. Bass’ tribute centers a wooden chair draped with a delicately embroidered shawl, crowned with an array of pipettes and surrounded by embroidered depictions of DNA, chromosomes and mitosis. Those themes replay in Pinky’s collaboration with Hank W. Bass, “Linkage.” Hank — Pinky’s son — is a biological sciences researcher at Florida State University. Colorful embroidered images depict in-utero forms, the cellular activity seen in the Lacks piece and geometry reminiscent of Sullivan’s aforementioned Spirograph. There are printed fabrics, light boxes with photos of edible grasses — wheat, corn, etc. — live maize and a ruler in a jar. The emphasis is obviously genetic lineage. Speaking of childhood toys, anyone who recalls the View-Master would feel at home with Peter Bahouth’s “VENT” series (2016) of stereoscopic images symbolizing his reaction to climate change. The three-dimensional photos of the artist and clouds of smoke rising through kudzu-covered landscape call to mind the “long hot summer” referenced in his statement. Barbara Hodnett’s “Making of a Food Desert” utilizes archival photographs of the 36603 ZIP code and the effects of the urban renewal efforts of the 1970s and ‘80s. Older photos of grocery stores, restaurants and other gathering spots contrast with their blighted contemporary states. There are audio interviews Hodnett conducted with longtime residents who outline the negative changes. Another features has maps of 36603 with details of food access and economics shown in shaded zones. The only beef with this display is that the maps on the flat screen could move at a slower pace. An admitted cartophile, I like scouring maps for details or patterns that can be understood best in that format. The most sizable piece is undoubtedly Jamey Grimes’ “Transpiration.” A floor-level portion is contained in a shadowy room where hundreds of suspended lengthy wires are illuminated by projectors with shifting perspectives while lights glow and fade across them. The illusion is magical, a ribboning sense of movement that vibrates across the walls. From the top springs a massive sculpture of reshaped corrugated plastic illuminated by patterns of LED lights. It balloons and spreads like a net suspended midflow in the ocean. Per the name, it represents water movement through plant life. In further thought, it’s environmental paradox. The creation of the plastic, the heat to reshape it, even the plastic bits chipped away to achieve the desired effect, all affect the environment to various degrees. Maybe what’s raised here isn’t food, flowers or water through roots. Maybe it’s awareness of our individual impact, artist and viewer alike. 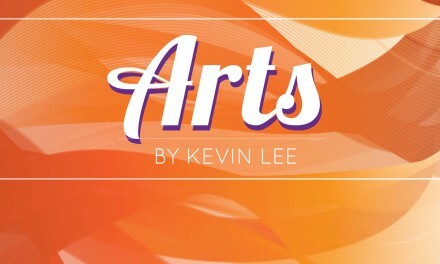 Kevin Lee has served as Lagniappe arts editor since 2003. He won Mobile Press Club awards for both Best Commentary Print and In-Depth Reporting for Non-Daily Newspaper in 2004 and 2005.